The new Python 3000 is bounding beyond Python 2. 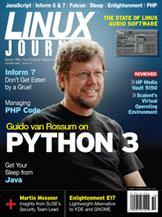 Python creator Guido van Rossum explains why you've got to try it. Not all programming languages are created for automating spreadsheets and device drivers—some, like Inform 6 and 7, were created specifically for making games. A language for practical extraction and reporting with mobile agents? Messages can carry anything, including methods or whole Sigma sequences for remote execution in foreign objects. Dave Phillips weighs in on the production side of music and sound software for Linux. PHP developers can get a comfortable, powerful environment with Eclipse plus some well-chosen plugins. Discover E, and unlock the secrets of Enlightenment. Dave Taylor's Work the Shell Movie Trivia—Finally!